ACE’s industrial ovens are designed to perform a variety of processes, including drying, curing, and preheating. The drying feature is used for components that have undergone the pre-treatment washing process. The oven can easily eliminate moisture from any kind of substrate. Curing can be performed to ensure that parts achieve an acceptable coating and surface finish. The oven increases the part’s temperature, allowing the applied coating to merge with it. Preheat option allows for the preparation of substrates for coating. Substrates can range from fiberboards to different types of metal alloys. 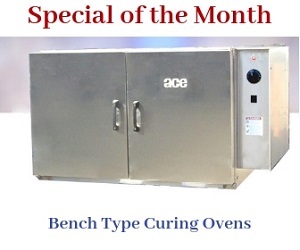 ACE industrial ovens are provided as “Install-It-Yourself” Batch Oven Kits. These ovens can be installed by the customer himself. This eliminates any extra expenses incurred from hiring a specialist. The duct work is designed to prevent direct air impingement. Direct fired burners are supported by electric motors. The combination of these two features makes the oven extremely energy efficient during operation. Automatic shutdown feature ensures safety of employees working within the vicinity of the oven in case of an emergency.